On Friday, Harmon Pool sat empty under a hot sun. A major water leak, dwindling funds and attendance were all reasons why the City of Point Pleasant decided to close the pool this year. However, city officials are attempting to either fix or reduce the size of the pool or find a replacement, such as a spray park, by next summer. POINT PLEASANT — City of Point Pleasant officials recently toured the Hurricane Spray Park to see if a similar facility would be possible at Harmon Park. 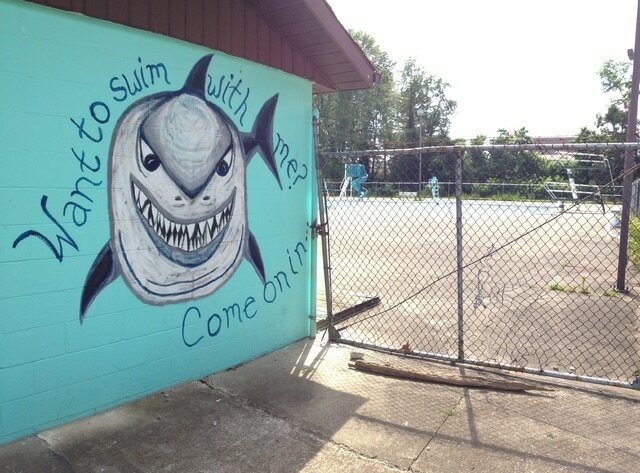 Since it was announced the Harmon Pool would be closed this season due to needed repairs, decreased funding and attendance, city officials have been attempting to come up with creative solutions that will provide residents with more recreational activities, not less, by next summer. Mayor Brian Billings said he, along with City Clerk Amber Tatterson and Councilman Bob Rulen toured the facility in Hurricane to get an idea as to if that type of facility would work in Point Pleasant. This visit was discussed at the most recent meeting of Point Pleasant City Council. “I was very impressed with the facility,” Billings told council members, adding if it was a feasible idea, it could be placed in the area where the Harmon Pool is now. This would mean the city would already be “ahead of the game” when it came to having existing restrooms and a place to sell concessions. Of course, this is just an option. Billings said he is still getting a company to inspect the pool to see if it’s possible to still use it after repairs, or even reduce it in size by filling in a large portion of the deep end — the location where a major leak is suspected. Billings has promised to repeatedly bring this issue up before council until a solution is found by next summer. Council passed the first of three required readings regarding a cost of living increase for various positions in city government. These cost of living raises will not take effect until July 1, 2016, after the city’s next municipal election and are as follows: City Clerk, current salary $35,000, proposed new salary $37,468; Water/Sewer Manager, current salary $44,500, proposed new salary $47,638; City Attorney, current salary $23,088, proposed new salary $24,716; Street Commissioner, current salary $34,216, proposed new salary $36,629. Police Chief, current salary $37,518, proposed new salary $40,164. Billings and council members also formally thanked three specific volunteer groups for their efforts to beautify, enhance and give back to Point Pleasant. They were Toyota’s Mason County Employees, Point Pleasant In Bloom and the GFWC Woman’s Club of Point Pleasant. Each of the groups received a framed certificate and were treated to light refreshments before the meeting.